Without a doubt, the most well-known and most-played of boardgames based in the worlds of H. P. Lovecraft is Arkham Horror and its many expansions. The original game, by Richard Launius, was published in 1987 by Chaosium, but in 2005 Fantasy Flight Games released this completely revamped version that took the gaming world by storm and continues to be one of their most popular games. 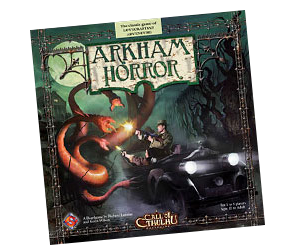 Set in Lovecraft’s fictional city of Arkham, players control 1920s characters who co-operate to roam the city gathering items, skills and spells in an attempt to close a series of otherworldy Gates that are releasing a tide of horrific creatures. Eventually, if they fail to stop the inexorable progress of the Doom Track, a Great Old One (GOO) itself may be released, which the players have a (very small) chance of defeating. Arkham Horror has been criticised for not really capturing the unique atmosphere of Lovecraft,due to its emphasis on combat, and the fact that, unlike in the stories, it is even vaguely possible to defeat a GOO in combat. But the fact remains it is a vastly entertaining game that is bursting with theme. Sure, it’s incredibly random and sometimes ridiculously difficult, but it really is one of the closest experiences to a role-playing game session that a boardgame can provide. The huge amount of supplemental material makes it endlessly different and engaging, and it can also be played solo. FFG has continued to support Arkham Horror with a steady stream of expansion sets—so many in fact, that it would be difficult to find a table big enough to play them all at once! The ‘big box’ expansions—Kingsport Horror, Dunwich Horror, and Innsmouth Horror—bring extra boards for those cities so the players can travel to these unique locations, lots of new components, and quite a few extra rules as well. ‘Small box’ card-based expansions—Curse of the Dark Pharoah, The King In Yellow, Black Goat of the Woods, and Lurker at the Threshold—have brought more cards, characters and special rules into the game. The last expansion was Miskatonic Horror, which probably holds the award for being the only expansion to the expansions I know of! Arkham Horror is certainly a beautiful, atmospheric game, though the rules can be a bit fiddly and it is very, very dependent on luck. Here’s a whole lot of stuff to make the experience smoother. The most popular and most perfected file (it’s up to version 7.1) I’ve ever uploaded to BoardgameGeek, this rules summary and reference pack includes all the reference material I have made for the game, and includes rules for all the currently available expansions. It’s also both an ‘all-in summary’ and in modular form, depending on how you like to mix and match your expansions. First up a HUGE thank you. This Arkham Horror aid is a masterpiece and one that had been included (and updated when needed) in my game for many years now, though since I just had to re-buy the game, I do need to reprint the sheets.. I do have a question, since FFG released the updated errata and FAQ in December, do you have plans of updating the player aids soon. I ask because I don’t want to print this all up and laminate it only to have a revamped one come out a month from now. Thanks for drawing my attention to that, I’ll check it out and see if anything needs fixing. Visitors to Boardgamegeek usually let me know pretty quickly if there’s an anomaly with this sheet though, as it’s my most popular one. I tend to only add things from an FAQ if there are actual rules changes; there are often many pages of specific cases and clarifications that don’t need repeating in a summary. Unfortunately I can’t ever guarantee that a sheet will stay set in stone—witness how this one has gone all the way to version 7, it being a game of so many fiddly rules and expansions. Cheers! I got into AH a couple of weeks ago and the reference sheets are a huge help. Outstanding job! I also use the mat for Mythos cards, printed and laminated. Thanks for this. area without moving.” is incorrect. According to the Official FAQ p4 ( http://new.fantasyflightgames.com/ffg_content/Arkham_Horror/FAQs/Arkham_Horror_FAQ.pdf ) You only have to fight / evade monster when you leave or end movement in an area. Not when remaining there. First fill the Doom track with Doom tokens.All players Lost in Time and Space are devoured and eliminated. Discard any active Environment or Mythos cards. If just a monster appears, it returns to the cup if not defeated and taken as a trophy. If just a monster appears, it returns to the cup if not defeated and taken as a trophy _otherwise_. Also, i’m not sure if it’s intended or not, but in B/W version page 18 (of colored edition) is missing. And here was I thinking that at v7.1 there were no more things to fix! 🙂 Thanks for the suggestions. You’re correct that it should be Rumor cards, I’ll fix that. I don’t understand your second recommendation though, putting ‘otherwise’ at the end of the sentence doesn’t seem to make sense – but the sentence is ambiguously worded and I’ll fix it. The numbering in the B&W version is different as there’s no board overlay in the B&W version. Sorry, English is not my native language, and as i was elaborating on my suggestion i figured it out. Anyways, i see you rephrased that perfectly in v7.2, thanks for your work! Just wanted to thank you for the Arkham rules summary. I use it extensively. I absolutely love your guide. I’m a high school teacher and run a game club. My students love when I take a day at the end of the year to run* a game of AH. The guide makes running the game smoother without having to flip through multiple rule books. THANK YOU! *A friend of mine uses and alternate method of playing where one person “runs” the game, pulling all the cards, reading them to the players, managing the doom track, etc, to help raise the tension (especially on those cards where you end up not knowing what you’re rolling for). I use this method with my students. Thank you for your prompt reaction! Looks totally incompatible with second, but intriguing.. If they got the game play under two hours I might be interested. Luckily I only have core box and that was second hand. Just noticed. Game lasts 2-3 hours. So no change basically. It will have to be different gameplay from Eldritch Horror to tempt me. Will there be a summary for the new 3rd edition? Eventually, though I have no plans to buy the new edition so it’s not high priority just now.